First off, what's the difference? 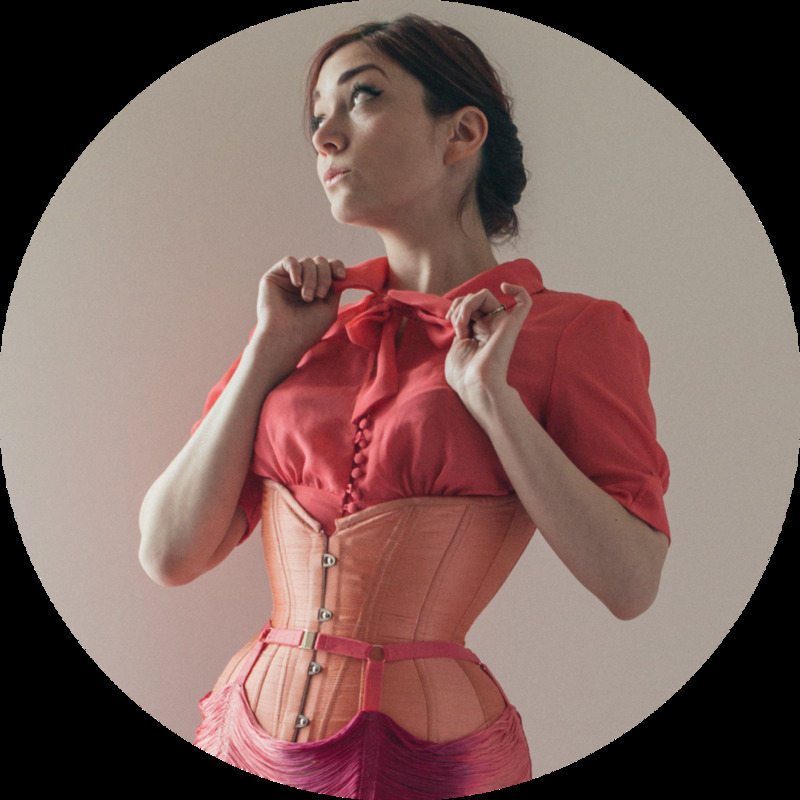 What makes a corset handmade? All lingerie (and the vast majority of all clothing) is still made by hand, in that you need a human to operate a sewing machine. Colloquially, "handmade" implies a smaller studio setup, located domestically, where garments are made in much smaller batches or even one at a time. A full mass-production setup will break down tasks as much as possible and have each stitcher working by rote on a specific part of a process. Hypothetically, you might have one person who sets busks all day, the next worker sews body seams, someone else stitches bone channels, then yet another puts on the binding, and so forth. A handmade item will be sewn start to finish by a single stitcher (although processes like cutting or hand sewing may done at a separate time for efficiency). Most corsetieres creating "handmade" pieces are one-woman operations (the vast majority are indeed women). They likely do the whole process from start to finish, from emailing with clients to stitching to the run to the post office. At best, they may have an assistant or intern to help... a larger scale than that is quite rare (Dark Garden being the notable exception, employing a small handful of corsetmakers who do their work on-site in the boutique). A lot of it boils down to variations of the "slow fashion" concept, which is multifaceted in its appeal. There's the ethical labor portion (which may or may not be present in a factory setup). After all, who doesn't like knowing that their clothing was made by an adult in safe and healthy working conditions and paid (hopefully) a living wage for it? Slow fashion also suggests an indulgence in minimalism: fewer pieces that are better made and last longer, rather than a collection of virtually disposable, cheaper garments. It can also be more satisfying to consider supporting a solo maker. Like an arts patron of old, you're not merely a "customer" or even just a "client." If a maker only does 10, 20 or even 50 corsets each year, each order stands out. You develop a special relationship with the maker: your commission ultimately makes a huge difference, from one individual to another. At Pop Antique, I have a couple of regular clients with whom I have an ongoing relationship. I know their taste and have the opportunity to continually refine the fit with each successive commission. I enjoy the interaction, trust, and stability of working with them. Having a good rapport between artisan and patron is essential to a positive custom garment process. That maker you're supporting may also have a unique perspective on aesthetics or fit. The piece you have may even be one of a kind! Your corsetiere's work is unique to them and identifiable from other makers'. There's no "one right way" to make corsets, so even if you're just getting, say, a plain black underbust, the maker's construction methods and combination of materials is like a fingerprint, setting them apart from their peers with subtle distinctions that may not be apparent at first glance. And, of course, with so few orders each year, you're probably getting a bit more individual attention. Your order isn't just one of hundreds on the production line each month. There's more care and also more flexibility. When each corset is sewn one at a time, there's more room for custom add-ons and adjustments, so that your order is just right, just for you. The downside to all this is that handmade work takes time. Fortunately for me and other makers, when you're creating a piece that will last years (if not decades), most clients tend not to mind the wait... but I can't fault you if that doesn't work for you. So it follows that there are still reasons to buy cheaper corsets. It's a privilege to be able to afford handmade work (most corsetieres couldn't afford "proper" corsets if they didn't make them!). Sometimes you may need a costume piece for performing or one-off use and you don't want to sully a "good" corset with cheap embellishment or party hazards like spilled drinks. And sometimes you just need immediate gratification. Whether you have immediate need or you just don't want to play the waiting game with a queue that is often months long, time might just be the deciding factor. What sorts of things do you keep in mind when shopping for or commissioning a corset? What have loved about buying a handmade corset? Let me know in the comments!